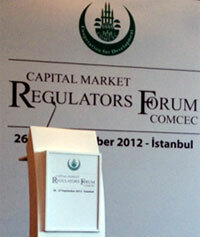 The First Meeting of the COMCEC Capital Markets Regulators Forum was held on 26-27 September 2012 in Istanbul, Turkey. The Meeting was hosted by the Capital Markets Board of Turkey (CMB). Heads and senior representatives of the regulatory authorities in COMCEC member countries, as well as the relevant OIC institutions, were in attendance. SESRIC was represented at the Forum by Mr. Nadi Serhan Aydin and Mr. Mustafa Sahin, Centre’s Researchers. The two-day meeting mainly discussed the structure and format, as well as the future activities and plans, of the four task forces – namely, the Task Forces on Market Development, Islamic Finance, Capacity Building and Financial Literacy – which were established during the COMCEC Capital Markets Regulatory Authorities Conference and Roundtable which was held on 16 September 2011 in Istanbul, Turkey. During the Capacity Building Session, where the participants were briefed on the scope and potential activities of the Task Force on Capacity Building, Mr. Sahin made a presentation titled “SESRIC Capacity Building Activities” and briefed the audience on the Centre’s capacity building initiatives, including its Capacity Building Programmes for OIC Stock Exchanges and Central Banks. During the discussions on the planned activities of the Islamic Finance Task Force, the participants were informed by Mr. Aydin of the Centre’s recent efforts in the area of Islamic economic and finance. The Forum took of the SESRIC’s willingness to participate in and support the activities of the Task Forces on Capacity Building and Islamic Finance. The Centre was elected by the Forum as an observer member in the Task Force on Islamic Finance. The Forum continued in the second day with a special session titled “International Organizations – Financial Cooperation Agenda”, whereby the representatives of the OIC capital market regulatory institutions explored the potential avenues for increasing its cooperation with multi-lateral development institutions such as Organisation for Economic Cooperation and Development (OECD) and Islamic Development Bank (IDB).